We are your premier supplier for Wholesale Power Bank Chargers, for buying in bulk and optionally printed with your logo. Our power banks are perfect for resale either with your retail branding or completely unbranded and we have packaging options for display in your retail setting. too and they can satisfy any wholesale need since branding with a logo is optional. Please note that where we show delivery times for our products that is for them to be logo printed with your own branding. Turnaround for unbranded power banks is a lot less. Probably the thinnest promotional power bank around, only 8mm thick with a large brand customisation area for Silk-screen, CMYK and full colour digital print. Clean minimalist tile shape custom logo power banks with a large print area. Pantone matched or one of 4 standard colours customised on both sides with silk screen or CMYK printing. Power banks as pretty as iPhones. In black or white your logo can either be engraved to allow a range of LED colours to shine through or with full colour print. Lithium Polymer in four capacities. Flat rectangular metal power banks with 4000mAh capacity for large-size logos or graphics customised on both sides using silk-screen printing or laser engraving. Polished metal company branded power banks with a sophisticated, elegant light satin finish in gold, silver or black as standard, extensive print surface for company logo printing or laser engraving both sides. An award winning design of power bank with huge capacities of 6000mAh to 10400mAh. Plastic rubberised look body with a polished metal band in gold, silver or copper colours. There is a motion sensor in these power banks that activates your bright LED logo when shaken slightly or when charging or connected to an energy source. The LED light is available in five colours. Super small logo printed power bank with four-colour logos and graphics, a lightning connector with built-in micro USB adaptor, loops to attach the power bank to a keychain or other accessories. These power banks have a backlit LED brand name and graphics fired up by a motion sensor that activates when moved, is charging or is connected to an energy source. 2 USB ports and micro USB and lightning ports. 4000mAh, 5000mAh & 6000mAh. A dual output corporate power bank with a dramatic high-gloss finish branded logo and graphic over a large 131 x 65mm area covered in tempered glass which dramatically emphasises four-colour graphics giving it a glossy elegant look. These printed power banks are thin with unique circular design with large area logo print up to full colour or LED illuminated logo, the Disk model is available in 2000mAh and 3000mAh packaged in a stunning Crystal Case. These credit card sized power banks have an inbuilt torch. Compact with full area printing for perfect branding up to full colour. Available in three charging capacities. The gorgeous Crystal promotional power bank has copius charge from 6000mAh to an impressive 10,000mAh with your logo in full colour print and protected by a clear crystal plate. The engraved option allows LED light to glow when charging. Pure genius to combine a branded portable phone charger with a lanyard so that a full colour insert or business card can slide into it. Optional LED illuminated back-light. A branded portable phone charger with whole surface full colour print and charge capacities of 4000mAh, 5000mAh or 6000mAh with the 142.2 x 74mm dimensions of the latest smartphones. A promotional power bank charger that doubles up as a LED reading lamp or emergency light. Choose a charge capacity from 6000mAh to a massive 12000mAh. Custom power banks that serve as LED illuminated advertising panels for desk top or counter top. Choose a charge capacity from 2000mAh to a massive 20000mAh. Brand the full area of these neat 80mm square full colour promotional power banks in a range of capacities from 2000mAh to 5000mAh. Different body colours available. A promo power bank with full colour logo print the whole top surface of this 80mm square QI wireless mobile charger. This promotional power bank charger uses lithium polymer cells which allow a thin profile giving this model a slender rounded shape. Storage capacity from 4000mAh up to a capacious 10000mAh. This branded power bank has a real bamboo shell and a round base with a micro USB port and the top surface can be have your logo applied via laser engraving or silk-screen printing over a generous area of 80mm diameter. An Express delivery smartphone charger with a 5000mAh capacity storage with your logo in full colour on the top surface that has a 96mm diameter. A low cost but excellent quality logo printed mobile phone battery charger with 96mm diameter branding area including LED printing. Promotional Logo: Silk-screen, CMYK printing, LED printing. Branded mobile phone chargers logoed using 1-5 spot colour or full colour on both the front and rear. The 8000mAh version comes in black or white body colours with silver or gold coloured trim. 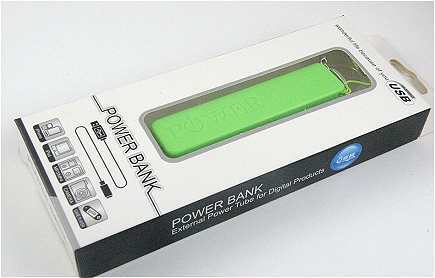 This power bank promotional item is a 4400mAh portable charger with rubber suckers to grip your phone or device to charge. Silk-screen printed or laser engraved with your logo for a cool corporate gift. With these wooden promotional power banks your logo can be silk-screen printing or embossed in relief over four sides 80 x 14mm. A power bank with a wooden body in walnut, maple or bamboo, and gun-barrel metal finishes each end. Printed power banks in rubberised look plastic with rectangular base and square-cut edges. A polished metal band at the base in three finishes: gold, gun-barrel or copper. A rectangular 4400mAh branded power bank charger with rounded corners entirely covered in bamboo with a surface customised with silk-screen printing or laser-engraved graphics or logos. Compact with a clean shape enhanced by the natural colour of wood. Square format promotional portable charger with rounded corners covered in bamboo. Compact 76mm square only 2cm thick with four battery sizes from 4000mAh to 6000mAh with silk-screen printing or laser-engraved graphics or logos. All the products in our Hi-Colour Range are available in these colours. The Hi-Colour Range extends to a whole family of colour coordinated products so that you can choose a range of matching but varied promotional gifts. That includes bluetooth speakers, Desktower charging station, car charger, wireless headphones and gift sets that combine many items together. Just ask Crazy Dave about the Hi-Colour Range. A few packaging options - many more, please ask. 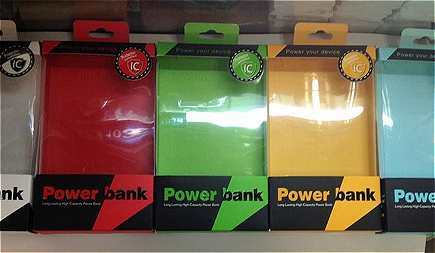 These transparent plastic packages are ideal for resale power banks since they are large enough to fit all the models and show the contents. The standard packaging is a card box with a plastic insert and a window so that you can see the type of product inside. This box is available for the Value Range shown above. White box printed with your branding. This is a simple plain white box which is printed with your logo.